As you can see, there are actually three speakers housed in each earbud. The two woofers pump out rich and tight bass, while a miniature tweeter deliver crystal-clear precision in the high ranges. To further provide cohesion to this system, an inline crossover has been implemented to discriminate between highs and lows, to make sure the right speakers are producing the range of sounds they specialize in, and ultimately to provide distinction between the two ranges for optimal tonal accuracy. This strategic blend of machinery produces a sort of balance that is often lacking in the earphones in this market, and you will never be satisfied with the typically compressed track while you own the E530PTH; loss less compression is a must while listening to music with these phones. Tracks with lesser quality simply don't do justice to the sound reproduction capabilities of the E530PTH. And despite the complex equipment built-in to these earphones, they are light to the point where you can forget they are hanging on your ears. On the comfort side, I found the foam sleeves to provide the best combination of comfort and fit for my ears. But my no means does that mean the foam sleeves are right for you. 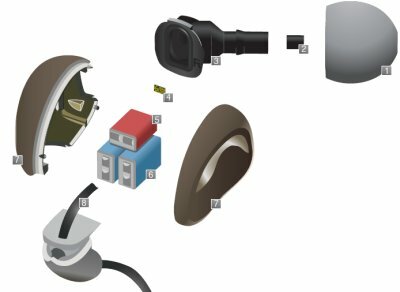 That's why Shure included a variety of different sleeves (much more variety in form than with previous earphone models); surely there's a sleeve that fits almost every ear to near-perfection. The trick to taking full advantage of the E530PTH's capabilities is to position the sleeve so that it is in just the right position in your ear canal; insert the buds incorrectly, and you will lose the bass, precision, etc. It may take some experimentation, but with the right combination of sleeve and fit, the music eventually comes alive in a big way. That 'aha' moment is pretty satisfying, and thenceforth you'll know how to get the most out of these earphones. The push to hear module should also be mentioned. I'll admit that I didn't find any real use for it and probably would not have purchased it had Shure made it an optional accessory (which it is, for other Shure earbuds). However, because it was bundled with the earbuds and many people could potentially benefit from such a device (or Shure wouldn't have taken the pains to develop it), a discussion of it is obligatory. The push to hear module attaches to the earbuds through a cable and is very lightweight. Simply activate the switch on the surface of the module and the outside world, as well as your own voice, are relayed to your ears through the earphones. The device basically consists of two microphones. 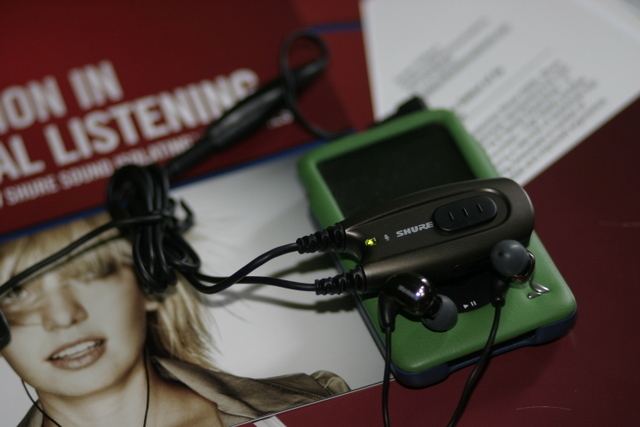 One within the main module to hear outside sounds, and one closer to your face that amplifies your own voice (smart). When someone appears to be trying to talk to you, all you need to do is switch on the device, and your audio becomes muted while the dual microphones start transmitting outside sounds to your earbuds. I've never had a problem with just taking the earbuds out, but I'd imagine for those who take a long time to find their sweet spot (in their ears) or who have sensitive or hard-to-fit ears this device would be a great convenience. For me, it's just extra stuff to deal with. Like I said, it's a cool addition bundled with the E530PTH, but I wouldn't buy the optional module were it not included.